When fitness instructor Liz Krueger wore a tight mini dress to a friend’s wedding reception, she didn’t expect a group of women to declare her a “target” and bully her the entire night, but that’s exactly what happened. Now, instead of letting the negativity define the moment, Krueger is starting something positive. Krueger detailed her experience on an Instagram post that has since gone viral. “If only I knew that choosing this dress for a wedding on a 90 degree day meant so many women would be outrightly (sic) rude to me,” she wrote. Krueger goes on to say that one woman slapped her on her backside as a dare because she became a “target.” Krueger told Us Weekly that when she turned around she saw a whole bunch of women cackling at her, but it didn’t end there. Krueger mentions that she didn’t wear the dress to the church ceremony and says the affair was casual as some people wore jeans and t-shirts. “It wasn’t like I was attending a black tie affair in this dress,” she said. So, instead of taking this experience negatively and lashing out, Krueger decided to make something inspiring out of it. She created #KruegerKindness, a movement that encourages women to be kind to each other no matter what. “I’m going to actively make it a priority to do good things for other women, every single day from here on out,” she wrote in an Instagram post. “Anything as simple as a complimenting a women daily (sic), buying them a coffee/lunch, taking the time to speak to someone who’s in a hard place, volunteering with girls who have been bullied, getting to know women deeper than surface level and making a point myself to not judge a book by its cover on a daily basis,” she wrote. The response to her campaign has been pivotal, with women everywhere showing their support. As for the dress, Us reports that Krueger would wear it again to another reception. 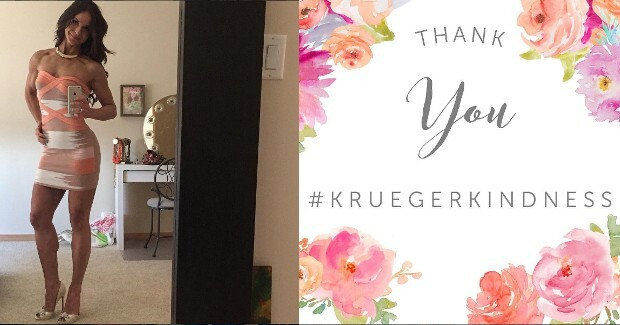 Krueger also writes that she’s currently planning events for #KruegerKindness, in hopes to spread kindness everywhere.